Most of you probably already updated Active Directory infrastructure from Windows 2003 to Windows 2008 R2. What I see most is that administrators do not upgrade DFS replication subsystem for SYSVOL shares. 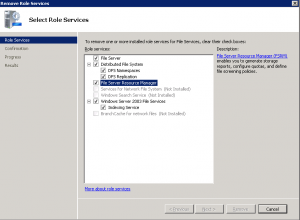 Before Windows Server 2008 (also R2) was released FRS (File Replication System) is used. 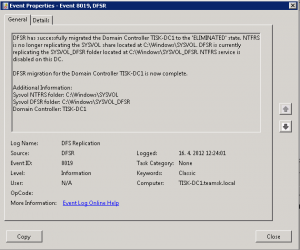 In Windows 2008 R2 there is new version released and it’s called DFSR (Distributed File System Replication). FSR uses NTFS volumes’ USN journal to determine when a change has occured to a file and triggers replication. When FSR detects file close it gathers information about file and it’s attributes. It also checks file’s MD5 hash. If MD5 hash changes it will trigger replication. 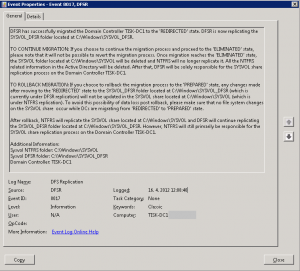 If file has changed whole file is send to FSR replication partners. First benefit of DFSR is that it doesn’t replicate whole file, but just a changed data in the file. To be able to check only changes in files it uses RDC (Remote Differential Compression) compression algorithm. When everythin looks fine, let finish it up. 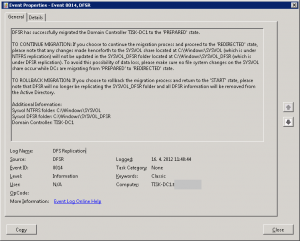 This stages eliminates FSR from replicating SYSVOL data. Now you have to check your replication really close, because there is no step back. There is no more C:\\windows\\sysvol directory. Just brand new DFSR directory C:\\windows\\sysvol_dfsr. If you don’t use FSR services for any other replication you can remove it from your servers by removing File Replication Service. I hope this arcite helps to keep your infrastructure up to date and use the goodies what new stuff brings. There are usefull utilities to manage/debug DFSR: DFSRADMIN, DFSRDIAG, DFSUTIL, DFSCMD and DFSDIAG. Is any command that shows you which protocol (FRS or DFSR) are you using for SYSVOL replication?